Pocoyo is probably one of the anime that I like for little children. My Robert grew up on that series and he (used to) love it. It's very simple anime, but very effective. The characters don't say much, but they have all the expressions. It's narrated by Stephen Fry and oh, he's so fab with his British accents. 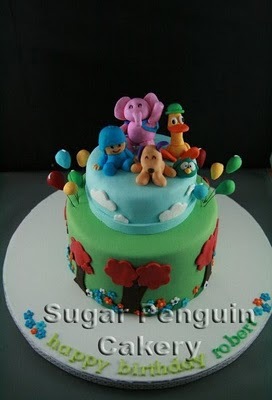 Pocoyo was one of my very first few cakes that I made, back in 2010. Back then, I was spending days and nights trying to get the details right. Elly's (the elephant) hand kept of falling because I did not know how to attach them properly. Pato's (the duck) hat was weirdly placed, and Pocoyo looked like a lego character... haha... I still remembered that I was almost in tears since the bottom of the cake was ripping and I had to re-do. Those were the days.... So here's the two Pocoyo cakes: the first one was the recent one, and the second picture was the one that I did back in 2010. 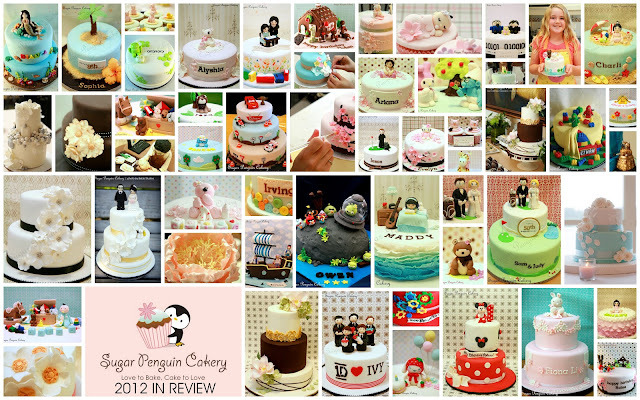 I am very happy that I have come so far and I am very proud when I see the progression of my cakes. The tiaras for this set were created by making a custom mold, then painted in edible silver luster, and a tiny little dragee (pronounced as DRAH-jay) on them. To make the "tiara," I molded a scrapbooking photo corner and shaped them up as "tiara" before I started to color them. Here are a couple of pictures of the set. We've been busy this year! 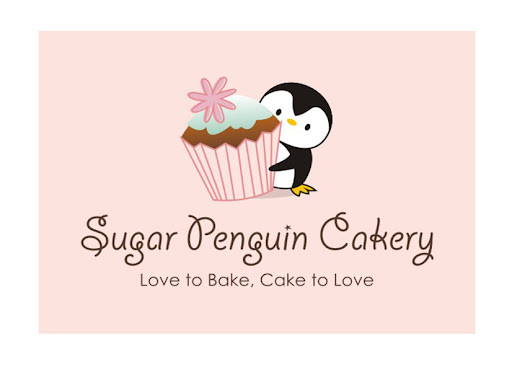 New skills and knowledge acquired, new friends bonded, and new, exciting adventure in caking ahead!